I’ve been working on two stories on Tablo, the free-to-read and help-to-publish website that is rather good to use. As I say over on my Author Info page, they are a pair of novellas; the first one, titled “EMC-Squared” is going through the artwork & editing stage. The second one, titled “the Juliet Gambit“, at the time of this blog post is in the first-draft / work-in-progress stage. Over all, for a “live beta”, the service is pretty good. There are a few annoying quirks, such as status pages that don’t reflect current stats, or “BookWorm” values that seem fixed in place for days at a time, regardless of other information on the site telling you differently. I’m a Safari web browser user, since I do a lot of my writing and business on an MacBook, and I expect that it’s one of those browsers than an “author-centric” service should support properly. However, a day or so ago, in spite of my initial enthusiasm for the service, I came to the conclusion that Tablo is a dead-end, at least for me. The reason is economics, which is something I’ve talked about before here on this site. Well, that’s pretty damn cool, isn’t it? Tablo sends emails like this at least weekly, giving you a sense that things are going well for your writing. I’ve had readers from the UK, the USA, Brazil, Germany and such. But this is the first time that Tablo suggested maybe I want to consider the next step, going all-in and publishing to paperback. Ok, that’s really encouraging. I mean, I’d like to think they are making that suggestion based on hit rate, read-time and the like. Real statistics that translate into possible reader spending. Curious, I followed the link. It took me to my “Publishing Options” page, where I can flip switches I’ve already looked at to enable publishing to Kindle, and other sites, and then in paperback. No mention of costs or anything here, though. I’ve got this as a screen-snap, since the Tablo website prevents copy-paste, for obvious reasons. My first reaction to those prices — $99 per year to list an eBook and $299 to list a paperback — roughly amounts to “go home, Tablo, you’re a drunk Aussie”. If I have to use a site like Tablo to publish, let’s be honest, I’m not making $299 USD a year. As I comment in my previous My Five Dollar Book, Coffee Vs Book or Trust vs Risk and It’s A Business blog posts, an established independant author can expect to sell 500 units in the first year for a book. Of course, an established independant author doesn’t need Tablo, they’re already set up. 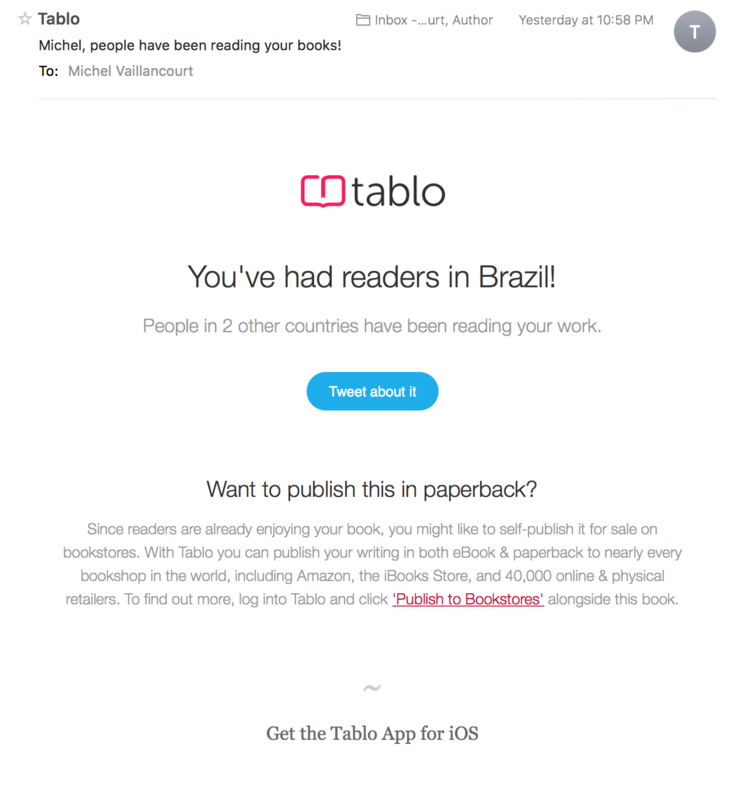 Authors like myself, who aren’t established, are the folks looking at services like Tablo. I know I don’t sell 500 copies a year of a new release. I’m roughly one quarter that, per published book, if all goes well. If I have to pay $299 USD a year up front to hope a book will sell and cover that extra cost … Uh, no. Firstly, it was not clear to me from the website if that is a per title fee or per author fee, or per year fee or one-time fee or, or … and if I can’t answer those questions from the FAQ, I have to presume it’s the worst-case scenario before I make any commitments. Tablo, if you read this, fix your FAQ and get some clarity. Please. They quote “40,000 stores and 30,000 libraries”, but ok, how is that different than Amazon KDP and CreateSpace? If that $299 includes active book promotion and therefore increased odds of a sale, that’s interesting. If it’s just more darts to throw at the board, well, 90% of the board is already covered by Amazon. If it doesn’t include active promotion, why would I want to front-load my financial risk, instead of absorbing it on a per-sale basis? In other words, why is $299 up front a better deal for the authors than a 30% per unit revenue split? They don’t say. There are no numbers, no hard data, to make an informed business decision with. One of those things you learn in a hurry in independent publishing is that “fee up front before visible results” is a warning sign. Now, I’m not accusing Tablo of being anything but above-board and well-intentioned. What I am saying is that, as presented, they aren’t making a good sales case. 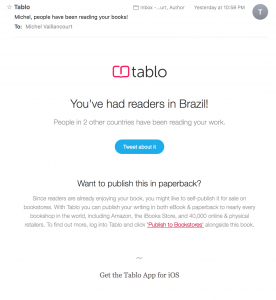 To put it another way, from a purely pragmatic perspective, why should I spend $299 up front with Tablo, as opposed to a targeted sales campaign on Goodreads or some book-blog website? What is the value proposition? I don’t know. So, for me at least, until I hear from other authors who are unrepresented unknowns like myself, Tablo is a dead end as a publishing service. I cannot afford the risk to experiment. The cover-art that I have coming for “EMC-Squared” is going to set me back a healthy fee, and the editing costs are substantial as well. I know that KDP and CreateSpace work, as they are, and I get results. Thanks very much for reading. If you’re a published author via Tablo, I’d love to hear what your experience has been. If you’re looking a Tablo, let me know what your thoughts about the pricing are. I’d love to hear from all of you. All the best, and good luck with your writing and your book sales!